Combining a 1/2HP AC primary sump pump with a 1/3HP DC battery backup pump, the Blue Angel® Gemini GSP50 Submersible Dual Sump Pump System provides unsurpassed basement and crawl space protection from potentially damaging flood water. Paired with either Apple iOS or Android applications allows for continuous monitoring of real-time status from anywhere, even when WiFi is down and the power is out. 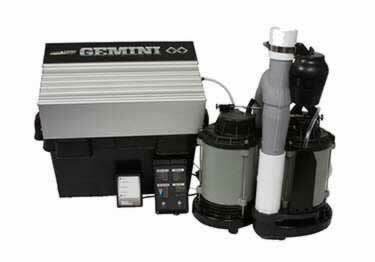 Offering ultra-quiet operation, the Gemini System is pre-plumbed for easy installation in 15 minutes in any sump pump basin with an internal diameter of 14" or larger. Receive free text and email alerts for power failure, low battery status, pump issues, and high water. Featuring a durable centrifugal impeller for maximum water flow, the Gemini System features a 1 1/2" NPT discharge for easy installation and compliance with building codes. Cast iron pumps, aluminum tops, and integrated circuitry provide increased reliability, while the battery backup can remove up to 11,000 gallons of water on a single charge. 1/2HP 120V primary AC pump: Max. flow 85 GPM; 64 GPM @ 10'' and 120W/12V Back-up pump: Max. flow 48 GPM; 32 GPM @ 10''. Features two pre-installed 1 1/2" check valves and redundant reed float switch with a protective cage. The mechanical float -- the most common point of failure -- is replaced with a solid-state, pressure-activated air switch. Designed with top suction intakes, the Gemini System has a 5 year limited warranty. Cast iron housing and base. Combining a 1/2HP AC primary sump pump with a 1/3HP DC battery backup pump, the Blue Angel® Gemini GSP50 Submersible Dual Sump Pump System provides unsurpassed basement and crawl space protection from potentially damaging flood water. Paired with either Apple iOS or Android applications allows for continuous monitoring of real-time status from anywhere, even when WiFi is down and the power is out. Provide controlled crawl space humidity for critical home safety, a healthy environment, & overall household comfort. Dimpled Crawl Space Drainage Mats help rapidly channel unwanted water to your drainage system. 6 ft. 9 in x 50 ft (20m)rolls. Guard against basement/crawl space flooding & sump pump burn out. Automatic overflow device if the line freezes or is blocked.